Pocket Cube; the doubly difficult new twisty puzzle from Meffert's! Before we dig into how amazing the Pocket Cube is, let's get a little background. There are two types of widely known twisty puzzles. The first is probably the best known, and that is a color manipulation puzzle. 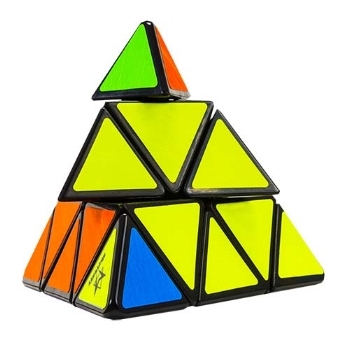 Like Pyraminx, Gear Cube, or Skewb Xtreme, the goal of a color twisty puzzle is to arrange all of the pieces so that the colors on each side of the puzzle match up. The obsessive part of me that color coordinates my closet finds these kinds of puzzles immensely rewarding! The second variety of twisty puzzle is the shape manipulation puzzle. This type of puzzle consists of rearranging all of the pieces back into their original shape. Instead of neat two by two, or three by three turning axels, these puzzles usually twist into unusual shapes. Puzzles like this include the Ghost Cube and the Gear Egg. These puzzles can be even more difficult than a standard color twisty puzzle because their pieces are bandaged. What I mean when I say bandaged is that after a few turns you will find that some turns and shapes prevent you from twisting a different piece. This adds a whole new level of complexity to solving the puzzle. Now we come to the Pocket Cube. This little beauty combines both of these styles of twisty puzzles to form a whole new beast of a puzzle. It may look like a simple two by two mechanism, but it is actually a bandaged three by three axel. After a few twists, you have yourself with a wholly unfamiliar shape and your colored cubes scattered all over the place. 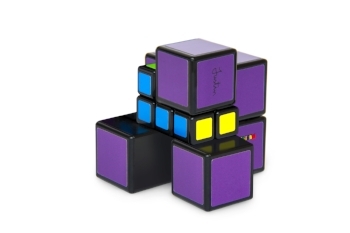 Do you think you have what it takes to solve the Pocket Cube? Well, I guess there's only one way to find out!